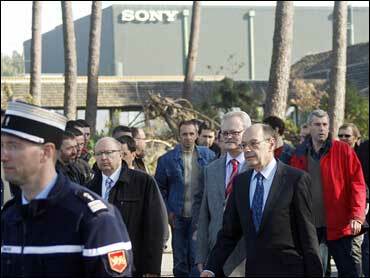 Workers at a Sony factory in southwestern France freed two company executives Friday whom they had held to protest the severance package offered for when the plant shuts for good. Serge Foucher, CEO of Sony France, and Roland Bentz, the head of human resources, had been prevented from leaving the plant since Thursday afternoon. The Workers' Council representing Sony employees agreed to let the executives out of the plant and to restart talks with management on the severance package. Regional authorities had persuaded the two sides to sit down and negotiate outside the plant. Talks were under way early Friday afternoon, according to the Workers' Council of the factory. Patrick Achaguer, a CGT union member at the plant, said the workers want professional training to help them find new jobs and financial help with relocation if they have to move to find work. "We are all going to be fired. We want to be treated in a dignified manner," he said. Sony announced in December that it would cut 8,000 jobs, or 4 percent of its global work force, including those at the plant in France, which produces tape and other recording media. A project will convert it into a solar panels factory, and 311 workers at the plant, south of Bordeaux, are to lose their jobs. "I will never find a job in my field around here," said Thierry Dussarat, 45, who has worked at the plant for 22 years. "Only big companies employ this kind of staff, and in this region they are rare." With the closing of the plant, which opened in 1984, Sony will have just one factory in France, near Ribeauville in Alsace. Sony hopes its global cost-cutting moves will deliver more than 100 billion yen ($1.1 billion) in savings a year by March 2010.